Cayuga Community College students Theodore Brill and Autumn Brewer act in “Foreclosure,” which was selected by the Theatre Association of New York State to be performed at the TANYS Theatre Festival, scheduled for Nov. 16-18 at Cayuga. Both Brill and Brewer received Meritorious Achievement in Acting awards for their work in the latest Harlequin Productions’ performances. Featuring a cast filled with new members, Harlequin’s performances of the six one-act plays that comprise “Rooms” nevertheless drew strong reviews from TANYS adjudicators, with eight students recognized for their acting abilities. On top of the acting awards, the play “Foreclosure” was selected for inclusion in the TANYS Theatre Festival, scheduled for Nov. 16-18, at the Irene A. Bisgrove Theatre on Cayuga’s Auburn Campus. 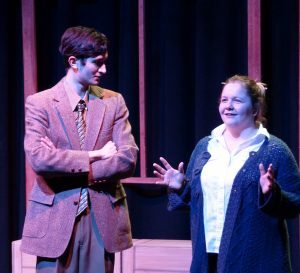 “It’s always great when the productions and the students are recognized, especially when it comes from someone seeing these plays and the students’ performances for the first time. The adjudicators are people who see shows and plays all over the state, and for them to single out our students’ abilities is impressive,” said Harlequin Director Robert Frame. Students receiving Meritorious Achievement in Acting awards were Autumn Brewer, Theodore Brill, Thomas Norris and Jack Hall, while Ariel White, Tristan Nolan, Sam Hodges and Kaylee Boise received a Meritorious Achievement in Ensemble Acting award. 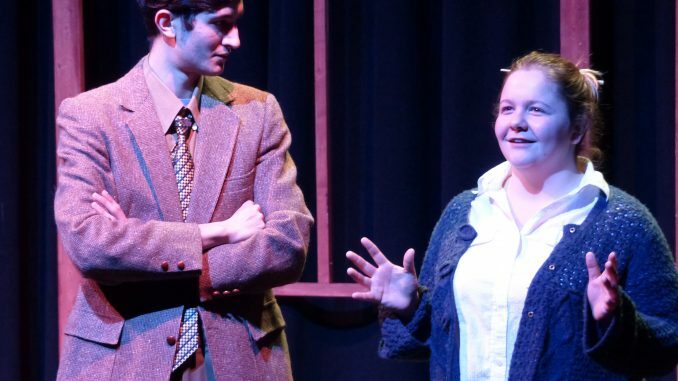 Frame hopes each year to have a show selected for the TANYS Theatre Festival, and this year “Foreclosure,” which features Brewer, Brill, Norris, Hall and Carmen Liberatore, was selected from a field of more than 40 productions. It is one of nine plays that will be performed at the festival. “I thought ‘Foreclosure’ had a great chance this year to be selected for the festival. It’s a strong script, and our cast did a really good job,” said Frame. Frame noted that playwright George Cameron Grant, the author of “Foreclosure,” is expected to attend the festival to see the students’ final performance. “Foreclosure” is the second scheduled performance on Sunday, Nov. 18, at the festival, with the curtain going up on the day’s first performance at 10 a.m.
For more information on Cayuga’s Harlequin Productions, visit https://www.cayuga-cc.edu/students/student-life/harlequin/.